You guys can pick up a copy from amazon.com by clicking here. You know that saying, “You can’t judge a book by its cover?” I know most of you have heard of it, and well, despite me being cliche about it, that quote pretty much explains my feelings about this book after reading it. I should mention the reason that I picked up this book on the account that Sue Falsone recommended this book on Mike Reinold’s Essential Reading Lists. I look up to both Mike Reinold and Sue Falsone as idols as they’re job is something I’d someday like to be a part of – a Physical Therapist for a Major League Baseball team. 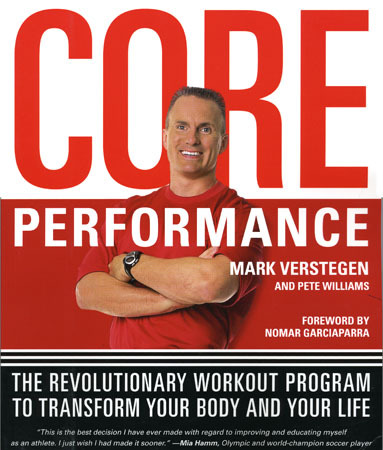 Just a little background information about Mark Verstegen – the author of this book. He founded Athlete’s Performance in 1999 which according to the website, “provides training, nutrition, and physical therapy programs seamlessly integrated under one roof by teams of specialists.” They get to train and work with a lot of big time athletes like Nomar Garciaparra and Mia Hamm just to name a few (they are also mentioned in the book as well as write some testament to Mark’s guidance). You can check out more about Athlete’s Performance by clicking here. The day I received it in the mail from amazon and I was a little hesitant about reading it. At first, it looked like any normal workout book I could buy from Barnes and Noble – probably finding it in the discount section among the other books. Fortunately, that was not the case! In fact, this was a great read for me and for you. This book is not just geared for high-profile athletes, although many give testament to Mark’s work, but the core philosophy and ideas are geared so that anyone can do it. That being said, the reading is also geared towards the general public so anyone can understand it. No cut and dry jargon that I was reading to help my study for my CSCS exams. Simple ideas are the core of this philosophy backed with science and common sense. Mark Verstegen tries to create a paradigm shift in our thinking not only in the physical fitness side of things, but also in nutrition as well. I don’t want to spoil everything, but I highly recommend this book for everyone who wants to lead a healthier lifestyle. Again, you can order a copy though amazon by clicking here. What do you have to lose? I mean the used copies go for no more than a couple of bucks. Take a step into changing your thinking about fitness and start creating a healthier lifestyle.